Thanks so much to Fab Shangreloo and Chic Aeon for writing about the Tekeli-li dollarbie in honor of Lovecraft day. It's properly diabolical, and it has so many options for the metal, gem, lens and tentacle colors that I was diverted for quite some time by playing with it... 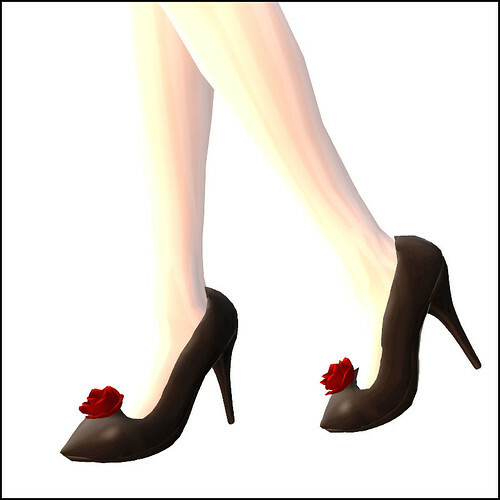 Continuing the color-scripted theme, my new shoes from First Flower have a pretty scripted flower on the toe! This Tekeli-li store is located on an interesting sim, a vampire steampunk sim -- I assume roleplaying? I like the idea of steampunk vampires, and want to see someone's take on a costume for such a thing. I can see cogwork vats of blood, mechanical wings, great-coats and very complicated spike throwers. Hm. Perhaps I'll begin a vampire hunting occupation in SL. Surely the growing population needs some thinning out. Check out the other very cheap items at this Tekeli-li location, including dollarbie earrings and hair. I'm wearing it with new hair from Philotic Energy that surely gives me cuteness bonuses to my dice throws, the Odile, and a jacket from Blue Blood that goes nicely with the skirt from Y@ni. 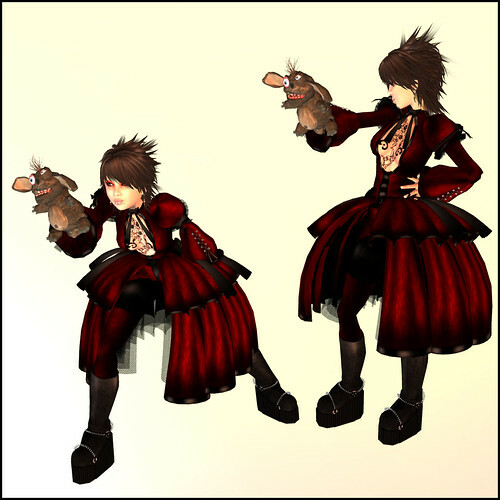 My poses are from the new Queen of Emo pose set by Pffiou, meant for wielding dual blades. Sleepy ramble. These photos have been fun, as always! I've gotten to meet people and see where they live... SarahtheRed has a cosy little cove with a dog and a one-woman shack (complete with Communist poster). I kind of loved her small nook of peace and quiet, which I thought reflected her relaxed yet posh style. She's wearing a falling-down updo (Kyoot's hot mess, a great hair) and a fancy shirt over a pair of jeans. I've also been playing with Photoshop a whole lot. I'm trying to figure out how to make naturalistic photos look all spiffy with blurring the background and playing with light. I'm not fabulous yet, but I'm working on it! For some reason, in black and white, Sarah looks like she's got formidable bewbs! To sail up in the skies. One fourth day of July. She's still up in the sky. ***Shoes: *katat0nik* ghostfire boots in yellow and red. ***Gloves and stockings: from the *katat0nik* mortido outfit (gloves) and le cupcake (stockings). Two weeks of rain and my child looks a bit like a caged hamster (with the same big, cute, mad eyes). I think I'll set up a hamster wheel and harness her energy to power my laptop. I'm in a pair of absolutely perfect fluffy bloomers from Sn@tch today. I've been bothering a few of my poor designer pals for bloomers like this, and now they can evade me, because these are just the sort I'd been looking for. Mourna wore them to gorgeous effect over here (along with new Philotic Energy hair), and I couldn't help putting together a contrasting look. 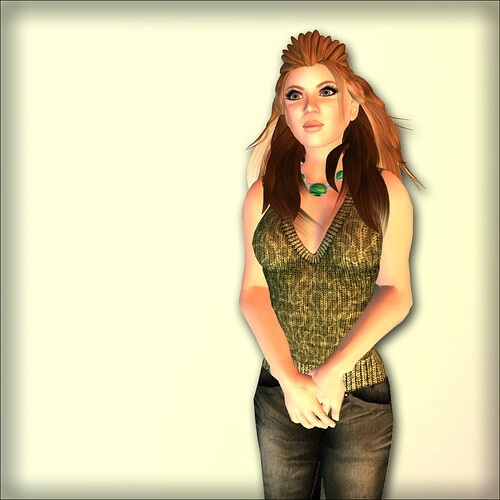 I'm also wearing a new hair (Fern) from Philotic Energy. I like the shape of it, the way the bangs and forelocks fall, and the flow when I move. Can you tell Mourna and I were at the same fashion show? The show was quite a lot of fun. I got to meet a number of people that I'd known remotely, like Yukio Ida of Illuminati. Adaire was the completely raunchy MC, and she did an entertaining job. 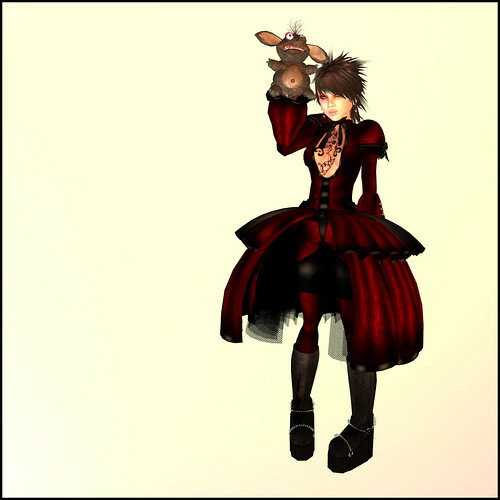 It's rainy outside, and I long to hang out with a faun (Brandy Rasmuson) and a bunny (Sakuradawn Lei) on a warm rooftop. I am continuing the "not me" series this week, and I've begun with Candy Cerveau. 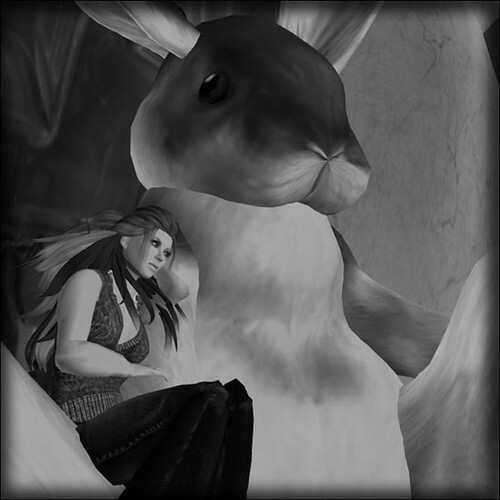 I caught her yesterday in the middle of working on a new build for her shop, Eye Candy, and she was kind enough to snuggle into a bunny for me. I like her style, very sleek and simple for building work, and in green (which reminds me of the Emerald City where her shop is located). Last night I was at the Sn@tch dance and said something totally ridiculous like I know I post a lot in my blog, I just hope y'all aren't getting sick of it." Of course, Winter chimed right in with "Too late!" After the usual round of insults, Winter and I whispered quietly that a blog war would be fun for April Fool's day... Which we accomplished early this morning. We had fun putting this together. Elusyve sat between us gleefully saying helpful stuff like, "Your hair isn't white enough" "Use the Trap skin" and "can I bonk both of you at once?" Her assistance was most necessary. In thanks for her help, we put together a small gay photo montage of Winter and Himself, and me and myself. So you get me in here today. We all know I'm prettier, dress better, and have more attachment points than that poseur will ever have. Plus, I'm a vampire, and we just naturally sparkle. If you want to see a REAL fashion blog, mine is over here. Looking around Acha's skybox, I realized the secret to her frequent blogging: ... Wait, Elusyve, get off me, I'm trying to type some... .fff ls sodjlaskl; ELUSYVE! Everyone will figure out why we don't blog as often as Acha! Fine, I'll wear the kitty ears, just let me type a moment! ELUSYVE! Get your hands off my .... You've got to save some for the other girls! Post three of Lazy Places style. I've been getting some incredible synesthesia lately, but not in the usual way. Instead of flashes of memory with smell, I've been getting computer screen synesthesia. Example: I'd put on this pair of pants from hybrid, and my mind filled with all the other stuff I was doing on my computer screen while I wore them, like the word document I was working on (a book review), my other browsers (my Japanese dress-up dolly), the roleplaying log I was writing in IM. I've never had this before, but this week it's happened twice... I wonder if this is a sign that my life is played out on this screen? I studied Sakuradawn hard to make this look today. I'm even wearing Sakura hair! I don't normally go in for hair by big-name designers because I figure other people wear it better than I do, but I quite like how "lazy" this Maitreya hair makes me look. I also ganked the very flexible jacket-layer patches from /artilleri's/ Vicky shirt and stuck it on her jacket. Welcome to post two of five-posts-about-Lazy Places. When I was putting together my outfits, I pondered Lazy Places style. I stalked Sakuradawn Lei's Flickr account to get ideas, and discovered that Lazy Places style consists of a few things. (1) Pants, usually jeans. (2) A cute tank top. (3) Stuff from Lazy Places. (4) Non-human bits, such as elf or animal parts. Working with these unofficial rules, I came up with this very lazy bunny. Today, the poses, the clever and cute Trix boots, and the head cupcake are all Lazy Places' work. I've been having a sucktastic week. When that happens, I post like a mad person in my blog (because it's a source of positive energy and fun), and I also start to sing Mr. Rogers lyrics to myself. Do you punch a bag? It's all Lazy Places all the time for the next five posts. Can you spot all of the kool Lazy Places items I'm sporting? 8D Don't forget the most awesome poses! Once upon a time I thought I'd be cool like Mourna and Sai and Sakuradawn and Ellantha and put on some elf ears. I came across a pair at Illuminati -- they were scripted to match Den-Dou skins! Den-Dou is one of my favorite skin makers, so I had much glee. 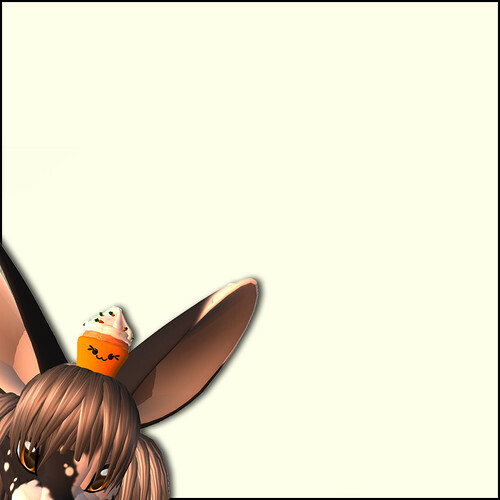 Then I spent about three hours trying to properly fit the ears. "Have you made your ear size zero yet?" Mourna said patiently, about sixteen different times. I'm wearing the perfect updo for elfy ears, Pixel Dust's Charlotte hair. Autumn is retexturing these, and they'll be in her shop soon. I like that stray tendrils of hair curl around the ears as if it was meant for pointiness. I'm also wearing an ethereal dress by Moonshine. It's raggedy with a beautifully tied-up back (one of my favorite parts of the dress), and the design really suits this stubborn, idiotic elf. Along with the necklace comes a story told better by Gabby over here; Ellantha let me know about this, and we both snuffled afterwards. Go say "heal!" -- And to the whole Fashion Planet feed today, I say heal! 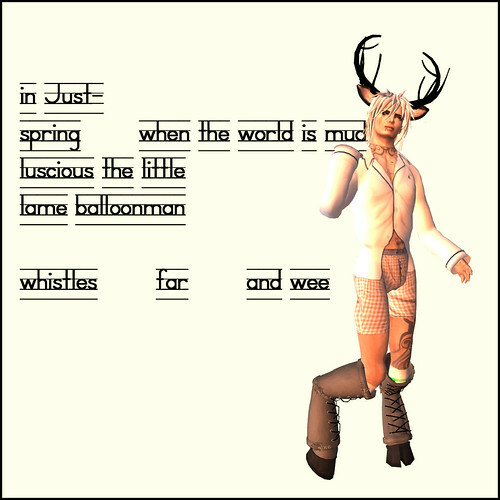 ***Poses: by AnaLu -- see the pose sidebar on my blog for slurls. When Fade Dana makes something, I know it'll be perfectly rendered and every so slightly disturbing. This is no exception, the Roadkill puppet that comes complete with a puppeteer hud. There's a version of the puppet that'll keep it held upright (like above), but if you want an AO with it, I recommend using Torridwear's Paraplu AO. Works like a charm, really, and it's what I'm using in these photos. The hud allows you to lunge forward and puppet at people, or laugh, or pet people (I think that's what that motion is). 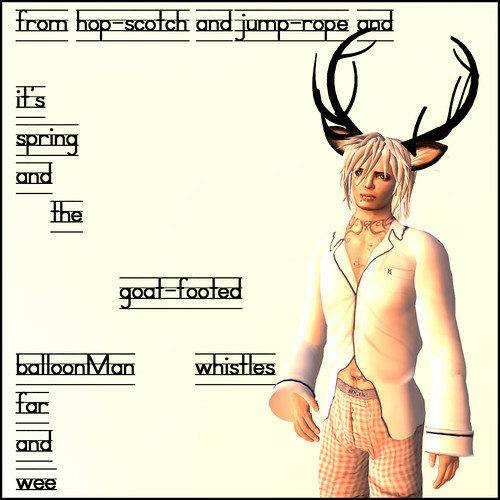 At any rate, it's another fine reminder of the range of stuff we can do in SL that has nothing to do with reality. 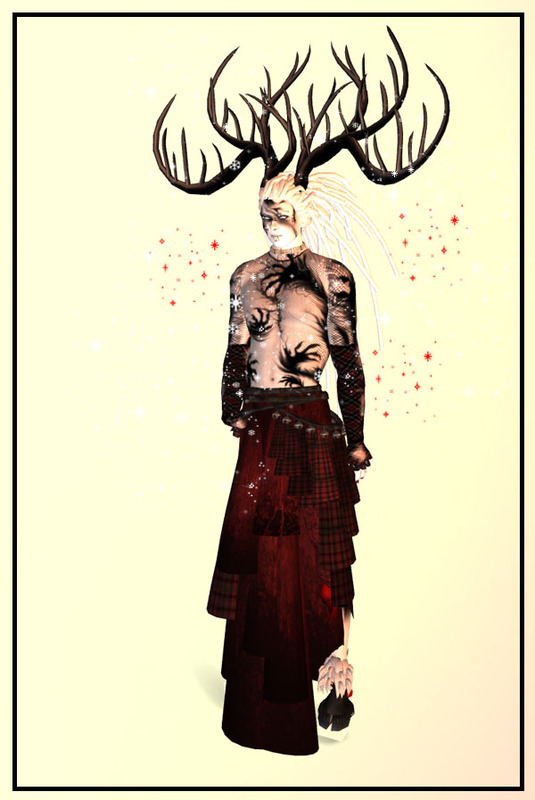 I'm wearing it with an outfit from Blue Blood -- Ghanima's prims are getting better and better, great work! My skin is from the new store Corrupted Innocence. I was taken by the neat and tidy mouth (not overly full) and the strong yet playful eyes. There are a lot of skinmakers around, but clearly there is a need for this kind of diversity, because everyone's vision of a good skin is completely different.